The Rings of Ruffles Pants offer loads of opportunity to get creative. These pants look fantastic when you keep the colors tonal (different shades of the same color) or when you mix all the colors up. I love adding pops of stripes or prints with the solids, too. Mixing some woven fabrics in with the knits for the ruffles works well, too…just keep in mind that wovens will fray unless you finish the edges of them. There are so many ways to put the fabrics together with these pants that each pair will truly be a one of a kind! 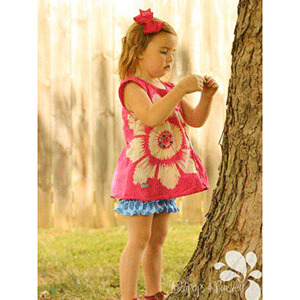 This pattern is available in sizes 2-12. 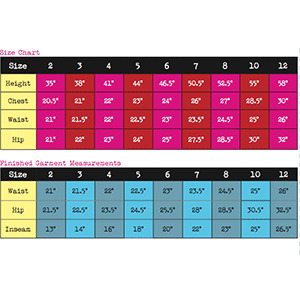 Suggested fabrics are knits with a 4 way stretch such as cotton lycra. You can also use a specialty woven for the ruffles.